It is very important to store your vintage textiles in order to preserve them for yourself or other family members. Controlling exposure to extremities such as light, bugs, moisture, dirt, and mildew can reduce the aging of your material. Storage locations should be clean and dark, with a relatively even temperature if possible. There are three main types of storage: flat (in boxes), rolling (in a tube), and hanging. The type of textile you wish to store determines the manner in which to store it. You want to make sure to use the proper method for storing your textile in order to keep it looking its best. Flat storage of textiles is the most recommended type of storage, especially for fragile items. Storage in boxes is the most common way to store textiles in a flat manner. Boxes should be constructed from acid-free materials, as the acid in cardboard can cause the material to yellow. Be sure to use a large box to prevent wrinkles and folding. Line the box with tissue, polyester wadding, or white cotton sheets. If using tissue, be sure it is acid-free, and avoid cardboard or wooden boxes. White tissue is recommended, as other colors can bleed onto fabric. Completely wrap the entire textile in the tissue, sheet, or wadding so none of it is exposed. If you must fold the textiles, be sure to put the acid-free tissue or sheet between each layer. Then add the lid and seal it completely. Be sure to put some slits in the box to allow air to circulate. Once packaged, textiles should be stored on rust-free metal shelves or in drawers. Rolling storage is recommended for textiles such as rugs and quilts. In rolled storage, textiles are rolled around a tube and padded with acid-free tissue paper. The decorative side should face outward. Fragile textiles and those with beads, metallic threads, and other types of adornment should be padded with extra tissue as you roll the item. Be sure to roll it with the lined side facing up. Do not fold the item any more than necessary. Do not roll painted textiles, as cracking may occur. Do not roll so tightly that you cause wrinkling. The best method for rolling is using a clear table or other flat surface that is at least as wide as the tissue paper or cloth. Add an outer layer of cotton muslin, which will act as a dust cover. Be sure to wrap it around the textile about 1 ½ times, and that the muslin is wide enough that you can tuck it into the ends of the tube. Securely tie the cover, but make sure not to cause folds in the roll by tying it too tightly. Hanging storage is for clothing and costumes (but nothing too heavy), as it reduces wrinkles that sometimes occur when storing lighter-weight textiles in boxes. Avoid metal and flimsy wooden hangers; instead opt for padded hangers in order to support the item. Sturdy wooden hangers can be used if they are wrapped with thick material, such as quilting or cotton batting or sheeting, to give them more support. Place a muslin dust cover over the item after hanging it. Avoid storing in plastic or vinyl bags, as they can deteriorate over time. It is recommended to wash the muslin cover and other cotton storage supplies that might be on the hanger annually. All items should be cleaned before storage. Be sure to follow the directions on the label. It is best to take your item to a reputable dry cleaner, as vintage items are very delicate. Do not use starch or other such items, as they can attract pests. You can also remove surface dirt with a vacuum for very delicate or antique items. Put the item under a cloth-bound fiberglass screen and drag the vacuum's brush across the piece. You can also use a hand vacuum that has a weaker suction. For extremely delicate items, you can also have them cleaned by an independent textile conservator. Storage locations should be clean and dark, with a relatively even temperature if possible. Attics, basements, and closets on exterior walls are poor choices for storage. Attic temperatures can be too warm; basements can be cold and are prone to moisture, flooding, and mildew; and closets on the exterior walls do not have even temperatures. Damage from light exposure can occur in a short amount of time and is irreversible. Be sure to check your textiles' condition yearly. Look for damage from insects and mildew, and take that opportunity to refold or replace tissue if necessary. Do not store items in airtight containers. If storing in a box, be sure to put some slits in the box to allow air to circulate. Avoid plastic or cellophane "windows," as they prevent air movement. They can also cause moisture to form inside and mildew to grow. Take the proper precautions when storing in wood. Wood and wood products contain oils and acids that can cause deterioration. Line wooden boxes, shelves, and drawers with Mylar or polyethylene sheets to create a barrier between the wood and your textile. Use only acid free tissue, muslin, or 100% white cotton sheets. That ensures that acids won't transfer from the wood to your textile. Always use acid-free materials. Washed, unbleached muslin, 100% cotton white sheets, acid-free tissue, and acid-free boxes are ideal for storing textiles. Label and date what you are storing. Write brief description of the item, its history, and the date it was stored. This is especially important if you are storing many items in identical containers. Take a picture before storing. This is for insurance purposes and also so your family has a record of it for other family members. Storing antique textiles the correct way is very important if you want to preserve your items for many generations. 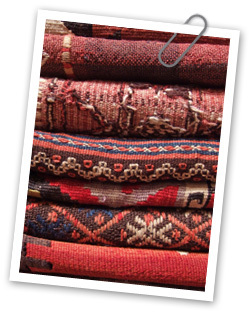 With proper care and storage, antique textiles can last for many years to come.